Walking a mile in someone else's shoes is one thing; switching bodies and not knowing how to switch back raises the bar to stratospheric heights. When Rachel Cole and Casey Lee wake up the next day after a party celebrating their twentieth high school reunion, they discover, in "Your Perfect Life" (Washington Square Press, a division of Simon & Schuster, trade paperback, 304 pages, $15.00) that they've switched bodies. 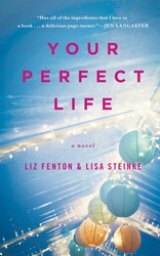 Authors Liz Fenton and Lisa Steinke use this fantasy device in their debut novel to illustrate the futility of envy, of thinking that your BFF has the perfect life and that your's is flawed, even dysfunctional. The book includes a reader's guide, making it a great selection for book club discussion. Plus, it's an excellent beach/vacation read. Rachel and Casey both live in Los Angeles, and are both 38 years old, but their lives couldn't be more different. Casey is the co-host of a TV show called "Gossip TV" and is in constant contact with celebrities. She's also facing hostility at work from her male co-host and from a young woman who wants her job. She's single and lives in a luxury Wilshire Boulevard condo that has as much personality as a hotel suite. Her friend Rachel's career path in broadcasting was derailed upon graduation from college when she married her high-school sweetheart, John, a pharmaceutical salesman now supervising other salespeople in his Santa Monica territory. Rachel was pregnant with her oldest daughter Audrey, now 17. They have comfortable life in Culver City with two teen-age daughters -- Audrey and 14-year-old Sophie -- and an "oops" baby, Charlotte. In chapters alternating between the newly switched Casey and Rachel, we learn how the Rachel inside Casey's body adapts to a career she trained for, an on-the-air-broadcasting personality. And, we learn how the single woman without children Casey -- suddenly confronting parenthood in all its forms -- manages to cope. "Jordan smiles sincerely. 'I'm sorry, I know you guys want me to wave a magic wand, but I don't have that answer for you.' We both remain silent, waiting for her to reveal something, anything. 'There is something that might help. They are telling me that you already have the answer to switching back and it's right in front of you. You need to to think about why you switched in the first place and that will lead you to how you switch back.'" Rachel and Casey also try to find the mysterious handsome bartender who created the magic potion cocktails that facilitated the transformation. Liz Fenton and Lisa Steinke have been best friends for twenty-five years and survived high school and college together Liz lives in San Diego with her husband and two children. Lisa, a former talk show producer, now lives in Chicago with her husband, daughter, and two bonus children. Their website: www.lizandlisa.com and on Twitter: @lizandlisa.